You can hear the sounds of last minute preparations behind the giant curtain separating the stage from the audience. People push past each other to get as close as they can to the front. In a few minutes the curtains will open and the Oakland based SWMRS will begin their show. There are hundreds of people waiting in anticipation, cheering each time they think the show is about to begin. When the curtains open, only the bassist and the drummer play. Shortly after, their other band members join them on stage. Their lead singer, Cole Becker, walks out in a dress, carrying a cherry red guitar. Every member starts playing what can only be described as punk music in its purist form. There isn’t a question as to what style of music SWMRS plays. As soon as the first chord is struck; you know you’re at a punk show. The music is aggressive and often times the vocalist yells while he sings. You can hear the emotion in his voice and feel the direct effects of the energy that he brings to the room. In addition to the vocals, the music is well written, the melodies get stuck in your head and the lead guitarist, Max Becker, is very tasteful in what he plays. The amount of energy the band gives off during their performance is reflected back at them from the crowd. The audience at the show starts to sway wave back and forth like a wave, running into each other on purpose and pumping their fists in the air in time to the music. The band commands the crowd like a conductor leading an orchestra. When they tell the audience to grow silent, people fall quiet. When they tell the crowd to jump, everyone does so. SWMRS doesn’t stay stagnant for a moment during their set. When they move, they do so with purpose and emotion. Even when a guitarist is tuning, they make sure that something is going on so that you don’t get bored. Nothing about the show is being faked. From the facial expressions they make to how they interact with the crowd, everything feels genuine. He also encourages everyone to be their own hero, start a band and do their own thing. It was really enjoyable to hear the band using their platform not only to play good music, but to also be using their voices to motivate the audience. By now, the fog machines have filled the dimly lit room with a haze, elbowroom is a thing of the past and people are getting ready for the headliner. 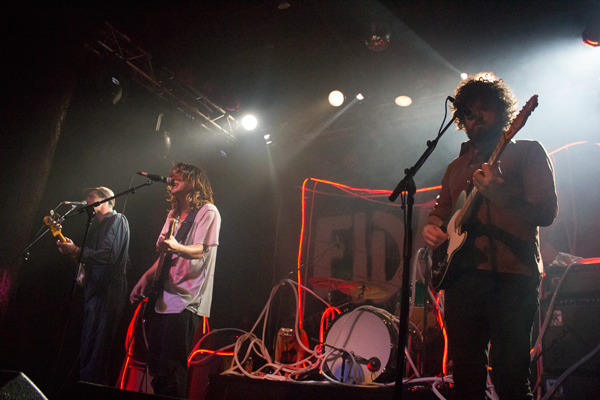 As people grow impatient to see the Los Angeles-based FIDLAR, they start chanting their name over and over. The curtains open again and the stage is dark. All you can hear is the Star Spangled Banner being played from the speakers while band members find their way to their places. The Star Spangled Banner ends, the lead singer, Zach Carper, screams into the microphone and then the rest of the band explodes into their first song. 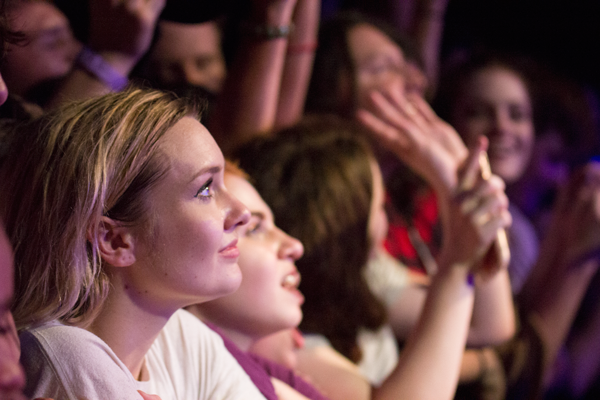 The crowd is responsible for how great the show is just as much as the band. People mosh, start walls of death, and express their emotions in a multitude of ways. For the people that don’t want to mosh, there is a balcony in the venue available to them so they could still enjoy the performance without being in the mosh pit. The stage is now haphazardly decorated with rope lights that are strewn all over the place. They change to different colors as FIDLER plays and look like a neon spider web. The light show going on doesn’t compensate for the performance or the band’s musicality, but instead accentuates each beat and emotion. As they playing along, people start crowd surfing, and the members move dramatically across the stage. Even though they move intensely, they stay on rhythm and showcase their musicianship. Each member of the band never ceases to move to the music, but never gets tired or peaks out in the middle of their performance. They continue to perform and rock out as much as possible during their whole time on-stage. The band could transition from face melting punk rock parts of songs, to ambient and clean parts seamlessly. They could change tempo on a dime in the middle of a song, showing their incredible talent. As they finish their last song and leave the stage, the audience begins chanting for an encore. After a few minutes of anticipation, FIDLAR comes back out and plays one more song before saying thank you to everyone involved that made the show a success. As soon as the show ended, I wanted to go back and see it all again. If you like crazy, intense punk rock music, then you would have loved SWMRS and FIDLAR. Their timing was spot-on, allowing the music to flow together perfectly. To some people, this style of music may sound like just loud noise, but it takes a lot of talent and hard work to make loud noise sound this amazing.